250 litre, 315 litre and 400 litre electric hot water storage systems. Flo-Rite Plumbing is an authorised Aquamax service agent for repairs and replacement units to the Brisbane and Gold Coast areas. We can offer the best Aquamax price on supply and installation of new electric hot water heaters and electric hot water service repairs. Energy efficient Mains Pressure Aquamax electric hot water, that keeps up with any demand you throw at it. Aquamax electric hot water systems are backed by a 5 YEAR MAXI-NAMEL CYLINDER WARRANTY. AquaMax electric hot water heaters are made by Aussies for Aussie conditions, right here in Australia, no matter how large your family is, you can count on Aquamax hot water units to supply all the hot water that you require. Winner of the energy saver award for three years running, Aquamax electric hot water storage heaters are proven 15% more efficient than any MEPS unit on the market. 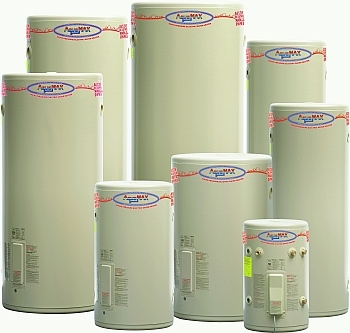 If you are looking to fix an electric hot water service, hot water system, hot water heater or hot water unit problem, Flo-Rite Plumbing has the best Aquamax price for Aquamax problems or replacement Aquamax hot water units. We are fully Licensed and Insured Solar Hot Water - Gas Hot Water Service - Heat Pump and Electric Hot Water Service specialists as well as Plumbers, Drainers and Gas Fitters. All of our trade staff have Plumbing, Drainage, Electrical and Gas Fitting Licences.